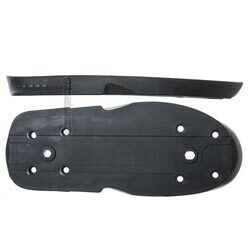 Note: If you're planning on using these replacement soulplates on the first line of Them Skates (Ivory or Black V1 908). You'll need to use the older hardware & re-drill the two bolt holes in the rear of the skate so that the hardware will line up. No modification necessary if your using them on the newer Darst Pro, Black/White, or Black/Black models. Them Skates Black Boot Only 11/12 ONLY! Them Skates Ivory Boot Only 11/12 ONLY!